This is my friend Kinan Idnawi. I caught this moment several years ago at the Higher Institute of Music as he was gazing outside the window toward the light. He now he lives in the United States. Kinan is a soulful and an accomplished musician who studied with the respected Azerbaijani instructor Askar Ali Akbar, played with the Qatar Philharmonic under the direction of world renowned Maestro Lorin Maazel, and performed worldwide including the Kennedy Center in Washington DC, Theater des Champs-Elysees in Paris, La Scala in Milan, and Teatro Massimo in Palermo. 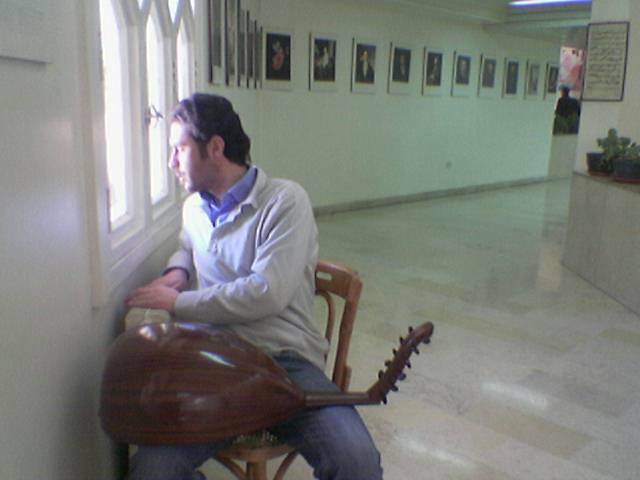 He is also the 2009 winner of the International Oud Competition, which was held in Beirut, Lebanon. This entry was posted in Musicians and tagged Kinan Idnawi, musician, Orchestra, Syrian music by syrianmusiclives. Bookmark the permalink.